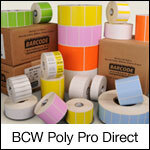 The BCW Poly Pro Direct label is a premium matte topcoated white polypropylene direct thermal label stock. This superb label produces high-quality black bar codes and human readable fonts and is far superior in wear and tear when compared to paper labels. All BCW Poly Pro Direct labels are resistant to abrasion, ammonia, bleach and water. BCW Poly Pro Direct labels are compatible with a wide variety of surfaces and temperature ranges on corrugated, glass, plastics and metal. 1.20" x 0.85" polypropylene direct thermal label on a 1" x 5" core. 2400 labels per roll / 8 rolls per case. BCW Poly Pro Direct 1151275 special features - Perforated. No ribbon required. 2.25" x 1.25" polypropylene direct thermal label on a 1" x 5" core. 1700 labels per roll / 8 rolls per case. BCW Poly Pro Direct 1153125 special features - Perforated. No ribbon required.